Bear and his animal friends are exploring the great outdoors and Bear sees wonderful colours all around them: blue, red, yellow, green, and brown. As each colour is revealed, readers are presented with a double-page spread awash in the designated colour. It’s filled with things of that particular colour to find, like blue water, blue fish, blue dragonfly, blue butterfly … and lots more. This is a cute story and a fun way to examine the concept of colours. Young children will love Bear and his friends, and be able to spend a long time pouring over the pictures looking for the different coloured items. 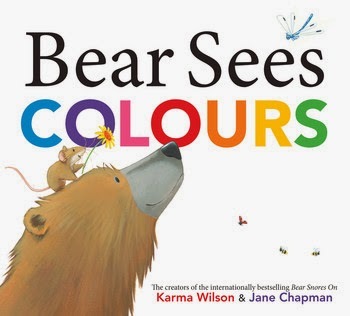 Read Bear Sees Colours then try playing a colour version of ‘I Spy’ around the house.